One of the most frequently asked questions posed to Boeing company historians is, "How did Boeing come up with the 7-7 name for its commercial jets?" 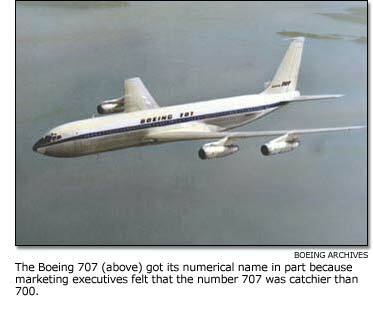 There are many myths about the Boeing 7-7 name, one of the most famous brands in history. People who lean toward math and engineering are certain that 707 was chosen because it is the sine of the angle of wing sweep on a 707. It's not, since the wing sweep is 35 degrees and not 45. However, more people lean toward superstition and feel that the positive connotation of the number seven was the reason it was selected. Boeing developed the world's first large swept-wing jet, the B-47. That aircraft sparked interest with some of the airlines. One in particular, Pan Am, asked Boeing to determine its feasibility as a commercial jet transport. At the same time, Boeing began studies on converting the propeller-driven model 367 Stratotanker, better known as the KC-97, into a jet-powered tanker that would be able to keep pace with the B-52 during in-flight refueling. Boeing product development went through several renditions of the model 367, and finally a version numbered 367-80 was selected. It was soon nicknamed the "Dash 80." Since both of these offspring of the Dash 80 would be jet transports, the model number system called for a number in the 700s to identify the two new planes. The marketing department decided that "Model 700" did not have a good ring to it for the company's first commercial jet. So they decided to skip ahead to Model 707 because that reiteration seemed a bit catchier. Following that pattern, the other offspring of the Dash 80, the Air Force tanker, was given the model number 717. Since it was an Air Force plane, it was also given a military designation of KC-135. Other than the 717, the only anomaly to the Boeing commercial jet numbering system was the Boeing model 720. The 720 was a short-range, high-performance version of the 707 and was first marketed to the airlines as the model 707-020. United Airlines was very interested in the 707-020 but had previously decided to go with Douglas and the DC-8. To help United avoid any negative public relations for going back to the 707, Boeing changed the name of the 707-020 to the 720. Since the naming of the initial 717, all Boeing commercial jets have been named in succession based on the 7-7 formula: 727, 737, 747 . up to the latest Boeing commercial jet transport, the 7E7.